NASA powered down the space shuttle Discovery for a final time Friday (Dec. 16), more than 28 years after the agency's retired fleet leader first came alive. 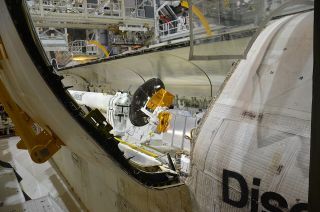 The vehicle was "unplugged" inside Orbiter Processing Facility-1 (OPF-1) at the Kennedy Space Center in Florida. The electrical shutdown, which came soon after technicians closed the shuttle's twin 60-foot (18.3-meter) long payload bay doors, was a milestone in Discovery's transition from a space-worthy orbiter to a museum exhibit. The shuttle, the oldest of NASA's remaining orbiters, is destined for display next spring at the Smithsonian National Air and Space Museum's Steven F. Udvar-Hazy Center in Virginia. Discovery's cargo hold — which carried to orbit the Hubble Space Telescope and Ulysses solar probe along with modules for the International Space Station and more than a dozen satellites — was closed for what may be its last time. The Smithsonian plans to display the shuttle with its bay doors shut, at least initially. The power down was much more permanent. Though Discovery's three electricity-generating fuel cells were reinstalled last week, they were first drained of all their reactants, and their feed lines were purged. Other than serving as an engineering example for researchers, they will never work again. Since landing back on Earth after its 39th and final mission in March, Discovery has been carefully taken apart to preserve some of its components for future use while making the vehicle safe for public display. Its engines have been removed and replaced with replicas and its thrusters cleaned of their hazardous materials. Inside its crew cabin, Discovery's waste collection system — otherwise known as its toilet — was removed, cleaned, and replaced, and its flight deck configured to appear ready for another mission, one that will never come. As with the fuel cells, the Smithsonian requested NASA keep Discovery as complete as possible so as to serve as a resource for future study. Discovery is targeted to make one last flight in April 2012, though not under its own power and well within the atmosphere. Ferried atop NASA's modified Boeing 747 carrier aircraft, the shuttle will be flown to Dulles Airport in Virginia. There it will be unloaded by cranes and rolled into the Udvar-Hazy's James S. McDonnell Space Hangar as its centerpiece attraction. Discovery will replace the prototype shuttle Enterprise, which the Udvar-Hazy has displayed since 2003. Enterprise in turn will be flown to New York City, where it is to go on exhibit at the Intrepid Sea, Air & Space Museum. See space shuttle Discovery’s payload bay doors close in collectSPACE.com’s Photo Gallery.